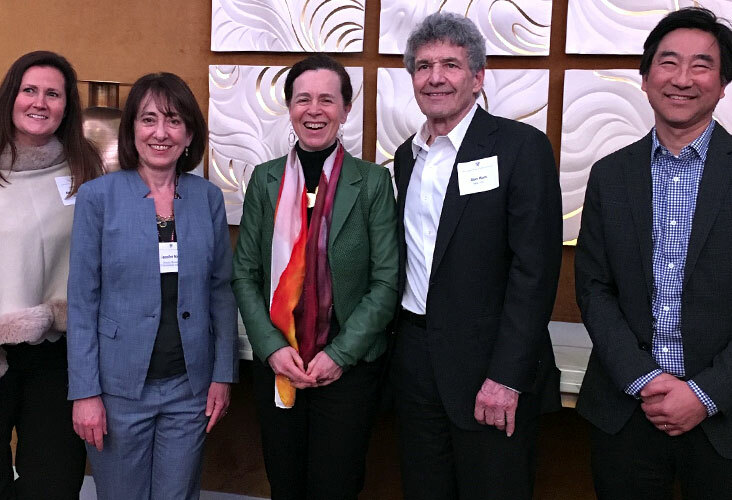 From left: Alexa McCulloch (MBA 1999), president, HBSASC; Jennifer Nash, director, HBS Business and Environment Initiative; Professor Rebecca Henderson; Alan Horn (MBA 1971), chair, Walt Disney Studios; Roland Hwang, managing director, Climate and Clean Energy Program, NRDC. Climate change is on the front page of newspapers everywhere. We are past the 11th hour and, according to the latest Intergovernmental Panel on Climate Change Special Report, the impacts are worse than we thought and our window to avert the worst of climate change is narrower than predicted. Net-zero emissions must be achieved by mid-century; the United States needs to cut emissions by 50 percent by 2030. These sobering facts did not discourage more than 80 alumni and guests who gathered on March 7 in Los Angeles for an HBS faculty-led discussion on business and climate change: The Reckoning: Reimagining Capitalism in a World on Fire. Opening remarks from Alan Horn (MBA 1971), chairman of Walt Disney Studios and chair of the Natural Resources Defense Council (NRDC) Board of Trustees, underscored the night’s charge: “There is an opportunity, if not a requirement, for the business community to step up where the political community has failed.” These comments were echoed in remarks by guest speaker Roland Hwang, managing director of NRDC’s Climate and Clean Energy Program. Drawing on 10 years of research and her hugely successful MBA course, Professor Rebecca Henderson used her keynote talk, “Reimagining Capitalism in a World on Fire,” to lay out a practical roadmap for how business can help to turn our world around—and how HBS alumni can help. Even faced with major obstacles, such as accelerating inequality, environment degradation, and the need for massive emissions reductions immediately, Henderson and the other speakers were optimistic that it is completely plausible to change today’s practices and norms. Despite ongoing debate about the cost of decarbonizing the world’s economy, Henderson estimates that making the shift to 100 percent clean energy might increase costs by 3–4 percent of world GDP, but the costs of inaction are far greater. The fact that the technology know-how exists today to solve these problems was made clear by all speakers, as well as throughout the participant Q&A and roundtable discussions. NRDC’s Hwang cited energy efficiency; renewables; and electrification of buildings, factories, and vehicles as the leading three technologies that are cost-competitive and can get us 90 percent of the way to emissions targets. When alumni asked for examples of climate-smart businesses to start today for financial returns in the next three to five years, speakers Horn, Henderson, and Hwang prioritized building retrofits, autonomous and electric vehicles, and ride sharing. They also spoke in favor of smart agriculture and plant-heavy diets. Beef consumption is especially challenging, they said, as demand for protein to feed the world’s rapidly growing population will spike, thus increasing the amount of methane in the atmosphere. Marrying agriculture and alternative technologies will go a long way in reducing 10–12 percent of total global emissions associated with agribusiness. Business cannot solve climate change by itself, the speakers acknowledged, but business can build a virtuous circle to promote innovation, collaboration, and overall behavior change. Henderson explained that businesses attempting to cooperate pushes regulation, which in turn creates incentive for innovation. Hwang offered a call to action: “Business can help heal the partisan divide that has stood in the way of policy action.” He mentioned three coalitions making strides: We Mean Business, Climate Alliance, and Environmental Entrepreneurs. Without purpose, even if you have a business case, you won’t necessarily act on it, the speakers noted. The window for meaningful policy action is short—we have less than 10 years to transition to clean energy, and to get there we must enact effective policies in the coming two years. This short timeframe poses challenges, said Henderson. “If we could afford to wait long periods of time, renewables would gradually replace fossil fuels, and consumers might begin to refuse to buy them. However, the trouble lies with huge fossil fuel assets that aren’t fully depreciated and that we need to stop operating,” she said. Therefore, it is critical that policy help raise the cost of operating fossil fuel assets and support the development of fossil fuel–free infrastructure globally, especially in Africa, Latin America, and China. Even approaching the 12th hour, alumni participants seemed ready to address climate change now, versus debating the causes of delayed action. “The sense that we must do this, that it’s essential to who we are as individuals and our responsibilities to our neighbors and our children, gives us the energy and the drive to take the risk to make change happen,” Henderson concluded. Organized by the HBS Business & Environment Initiative (BEI) in partnership with the HBS Association of Southern California (HBSASC), The Reckoning: Reimagining Capitalism in a World on Fire was the sixth in a series of HBS regional alumni events on the role of business leaders in the age of climate change. Learn more about past and upcoming events here. The impact of climate change will be felt around the globe in the coming years. Learn more about the implications for business in this HBS Background Note (pdf). Visit RebeccaHenderson.com to find readings and course syllabi, and to pre-order her book, or go to the Business & Environment website for hundreds of related HBS teaching cases and research. Confronting Climate Change: Risks and Opportunities lists additional resources alumni can use to explore the topic. Learn more about Harvard’s plans for a fossil fuel-free future by 2050.